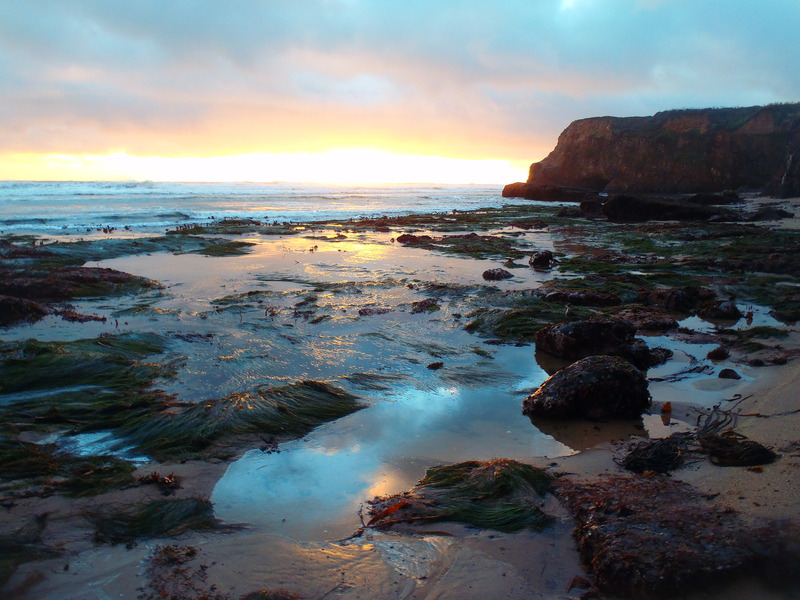 Join Blue Water Ventures every summer as we explore the sea caves, rock gardens and rivers of the Mendocino Coast. Our next program is designed especially for families, summer 2014. Using Sit-On-Top kayaks, we’ll paddle into caves, rock archways and over kelp beds as we look for local residents such as harbor seals and river otters. 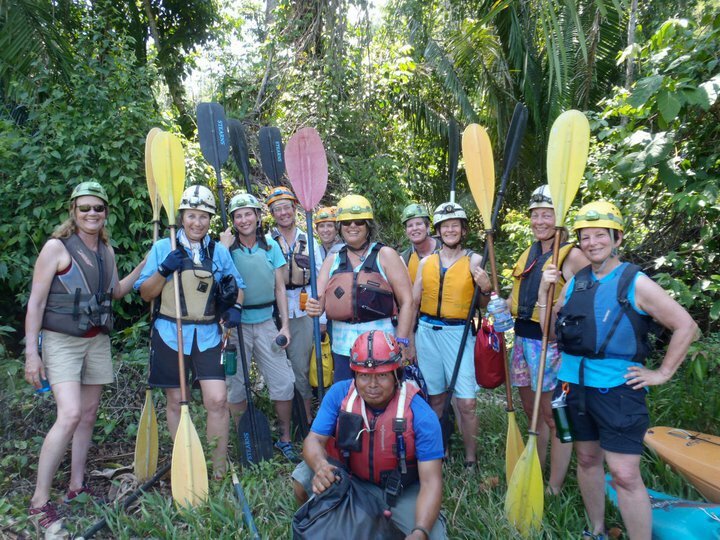 First time kayakers with a sense of adventure welcomed! Join us! You will not regret it! As I pack up for our upcoming Baja Adventure, I reflect upon what an amazing year we had in 2011. There were so many outstanding highlights some captured in these photos. I have led trips to Caribbean Reefs for decades and was extreme tidepooling as a kid long before I coined the term. What fuels my soul are the people who join my Blue Water adventures. Taking 10 year olds snorkeling with eye level views of sea otters or plunging into a Sierra stream is pure bliss, medicine for the soul. I’ve shared Elkhorn Slough with wonderful families who really care about the ecological wonders of one of California’s last wetlands. My trips for women are more like adventures with great friends. I feel so lucky to have an amazing following of women, many who return for every adventure I throw their way. We have spent a day underground kayaking below the Belizean rain forest, snorkeled at night with bioluminescence draped over the reef, sailed the blue and thrown ourselves off granite rocks in the Sierras. Its been an unforgettable year of wildlife encounters……baby manatees, massive whale sharks, gray whales and tiny frogfish, all so awesome in their own right. 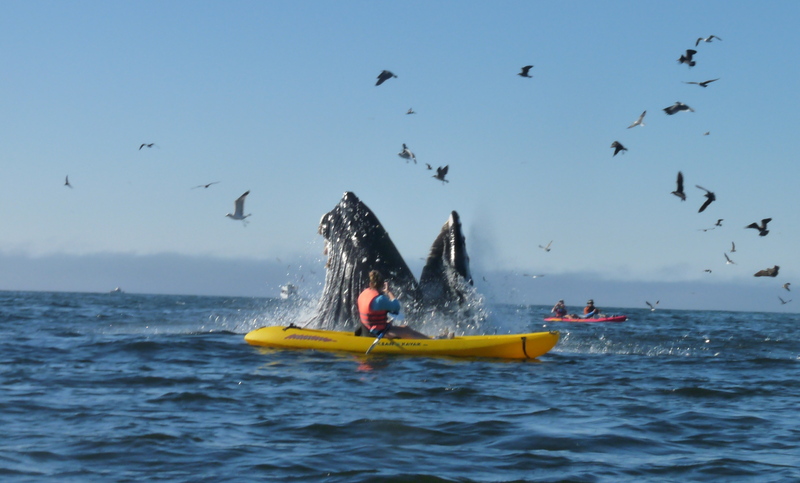 Kayaking among the Humpback Whales of Santa Cruz last fall was a lifetime high point. Funniest trip moment? 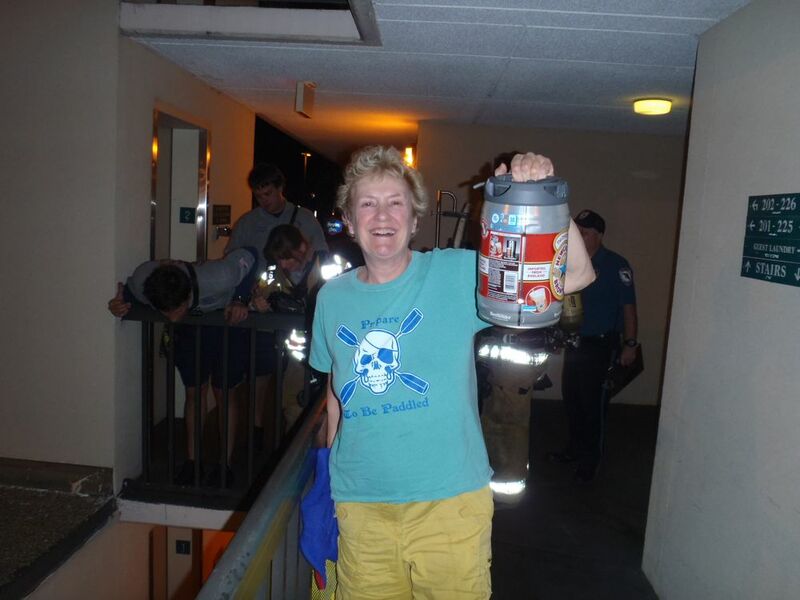 Dr Ruth finding herself trapped in a broken elevator with a keg of beer, Florida Springs trip. The Ocala firefighters were on it! I am faced with some personal challenges as I care for Mama Bear and juggle time spent with her and travel. My trips are healing during this challenging journey. I treasure each day I have with Bear. Having her in my life is truly a gift. 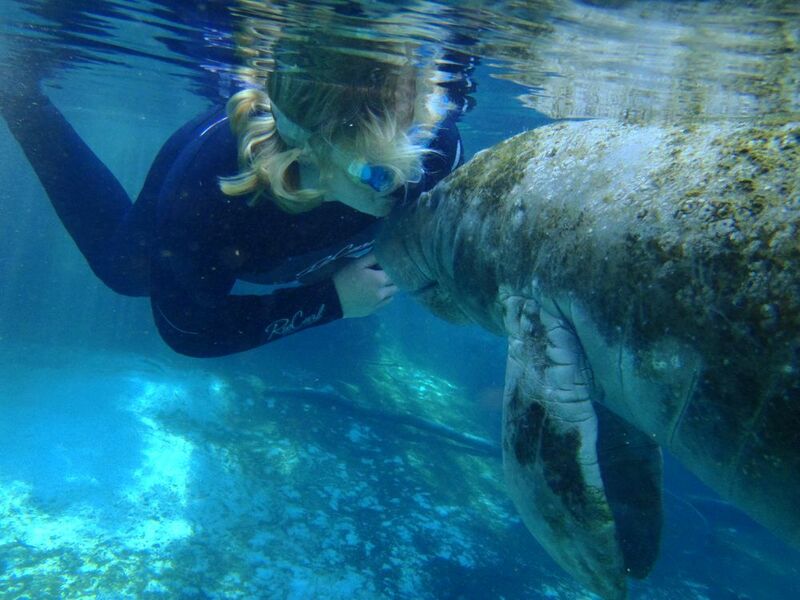 On my Blue Water adventures, I am rejuvenated by sharing the wonders of the world with those who follow. In 2011, I loss a dear friend, Jim Bitler who I dedicate this year to. Jim was one of the greatest naturalist and historians of modern times. Jim was an inspiration, friend and devoted partner who enriched my life and countless others. I thank my Blue Water Ventures community for these memories and lessons I’ve learned from each of you along the way. May the Wild-Life be with us in 2012! It started with an excited cry from Biology Teacher, Jane Orbuch ” Kim, there’s a whale”. I had just led 14 San Lornezo Valley High School students by kayak to the kelp beds edging a surf break known as Indicators in Santa Cruz. We were just about to begin a lesson in Kelp Forest Ecology. Slipping off of their sit on top style boats and into the invigorating 55 degree water, the students were anticipating an eye level encounter with sea otters, harbor seals, top snails and other wonders of this remarkable marine ecosystem. Humpback Whales were not in the lesson plan. 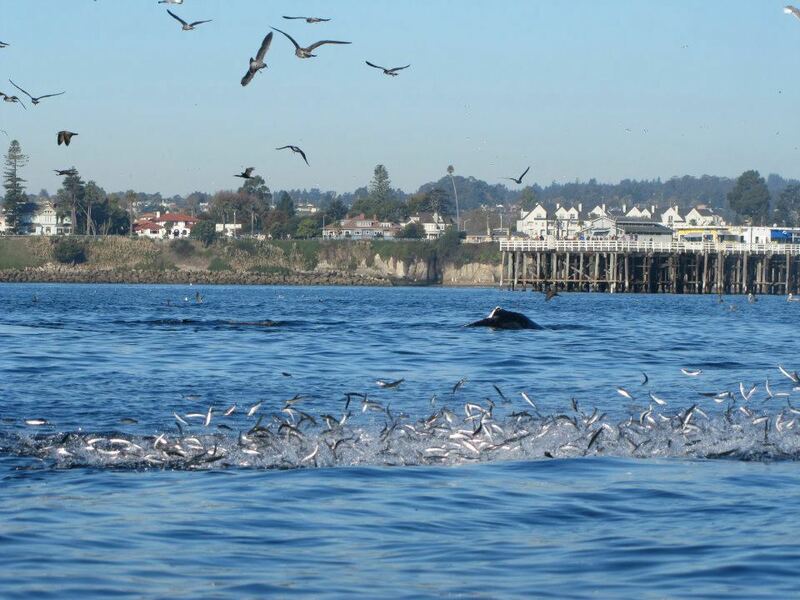 Monterey Bay National Marine Sanctuary has recently been coined the "Serengeti of the Sea". The Sanctuary lies within a biologically rich pathway intersecting the migration patterns of an array of marine mammals, sea birds and even our planet's most elusive and largest sea turtle, the Leatherback. 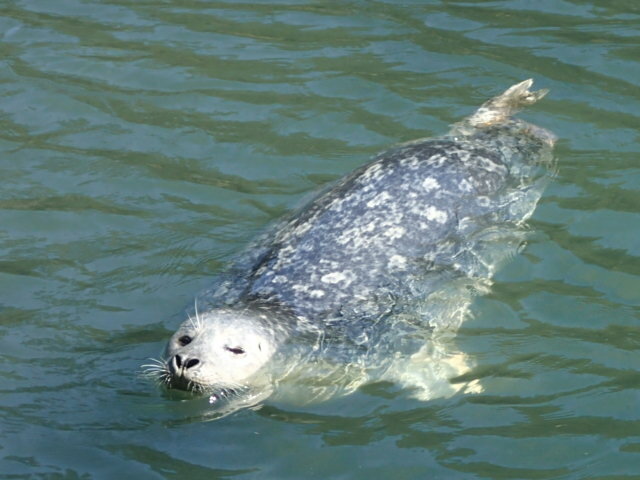 26 species of marine mammals are found in Monterey Bay National Marine Sanctuary, the largest federally protected marine reserve in the United States. Jane's discovery was the beginning of one of the most unique 12 days of wildlife observation in my 27 years as a naturalist. Humpback whales, weighing 80-90,000 pounds and reaching a length of 50 feet rarely meander close to our shore where water depths average 30-40 feet. Their visits to shallow water are more typically ethereal, making an appearance for a few hours or a day. Humpbacks are filter feeding whales that use their fringed plates of baleen to sort out krill, a small crustacean that congregate over the plankton rich Monterey Bay Canyon. Humpbacks are known to switch their food selection to larger bait fish such as anchovies and sardines when the situation presents itself. 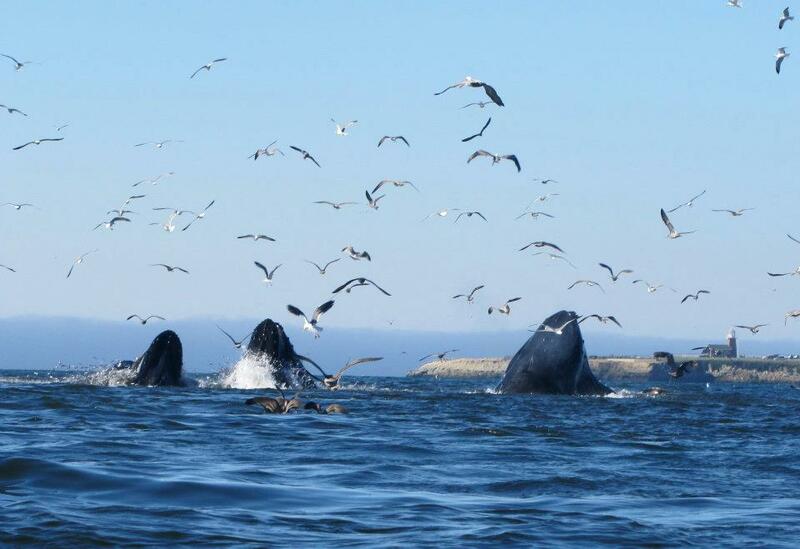 Our visiting whales developed quite a taste for anchovies that were schooling close to shore. The magical 12 day journey had begun. As the students slowly paddled offshore, I glanced at my fore arm and noticed that every hair stood erect. I was virtually speechless, a condition that my students have rarely witnessed over the years of my interpreting ocean wonders. The four instructors managed to share a few Cetacean facts and viewing etiquette. In truth, it was an extraordinary educational moment that required no words. The whales were centered stage and the students witnessed an array of behaviors from pectoral fin slapping to the most impressive behavior of all, a breach, when a whale propels its body out of the the water followed by a dramatic plunge downward. Lingering in our memory bank will be the unforgettable scent of anchovy breathe expelled through the blow hole of an exuberant whale. 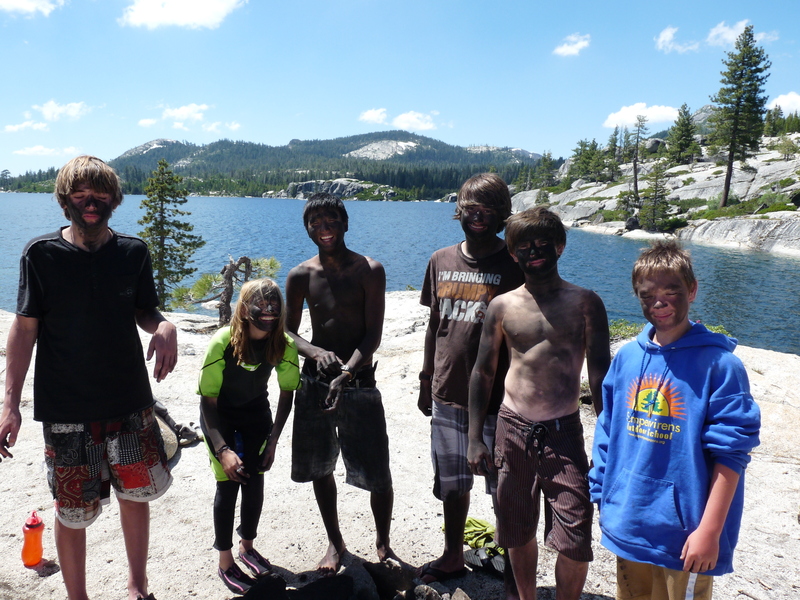 As we paddled back to shore, one student proclaimed: "This had been the best day of my life". One of the most profound experiences of my life occurred several days later. Launching from the Santa Cruz Wharf, a friend and I made our way by kayak toward an area where we had seen a few spouts. As we neared the vicinity where the whales were last spotted, we stopped paddling and drifted. 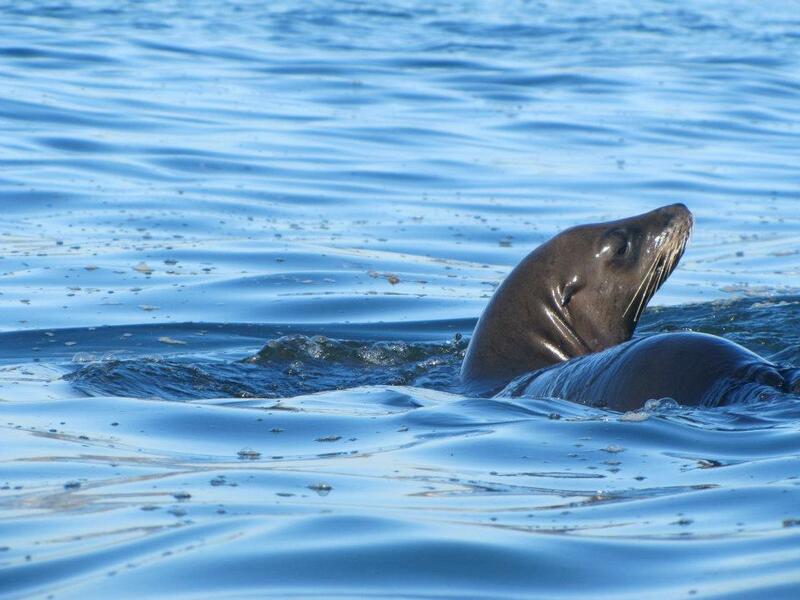 Without much warning, we found ourselves surrounded by a pod of very energetic sea lions. We observed them quickly alter their course and leap out of the water, a behavior known as " porpoising" which occurs when seals pursue prey or are being pursued by a predator such as a White Shark or Orca. The prey, in this case were anchovies feeding on a rich soup of plankton. As the sea lions rocketed towards us, our immediate instinct was to back paddle. We started tapping our plastic vessel letting any stealthy 50 ton visitor know our location. Then one of the most incredible moments of my twenty seven year career as a naturalist occurred. As we drifted and tapped, a humpback whale gently raised its head out of the water approximately five feet from us. This astounding behavior is known as "spy hopping", when a whale approaches an object such as a boat to take a better look. The whale's eye will either be slightly above water or just below as the whale glances upward through the water column. We were being checked out by a 90,000 pound creature. As quietly as it had arrived, the whale sunk back below the blue hued sea. I struggle to find the words to express the feeling that flooded through every pore of my body. We were in awe and overloaded by the adrenaline that pulsated through us. 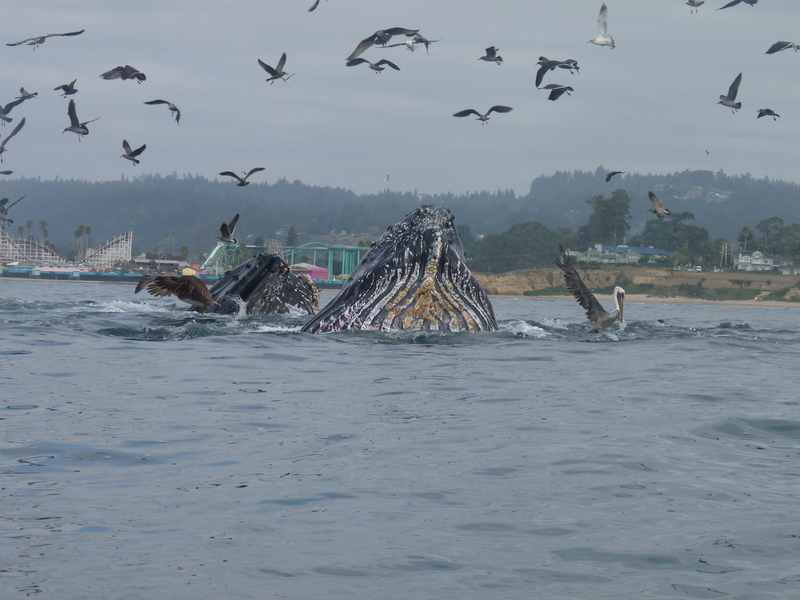 Several days later on a Sunday, I led my one and only commercial trip to experience the whale phenomena that was occurring in Santa Cruz through my business, Blue Water Ventures. Before launching, I instructed my group of kayakers on proper whale etiquette and informed them that they would be escorted back to shore if instructions were not followed. The image as we departed Santa Cruz Harbor will stay with me for years to come. The interest in viewing had exploded since earlier that week when there were just three of us and the whales. It was a view of ecotourism gone astray and we were contributing to it. Federal law requires us to stay 100 yards away, the length of a football field, from any marine mammal. Just leaving the harbor brought us too close as we soon discovered that the whales were positioned just outside Santa Cruz Harbor. The horizon was hauntingly still, though noisy with the image of human bodies standing upright on boards, kayakers, boogie boarders, surfers, sail boats and motorized skiffs. Moments later a helicopter circled above. Unbelievably whale watching by helicopter had arrived on the scene. 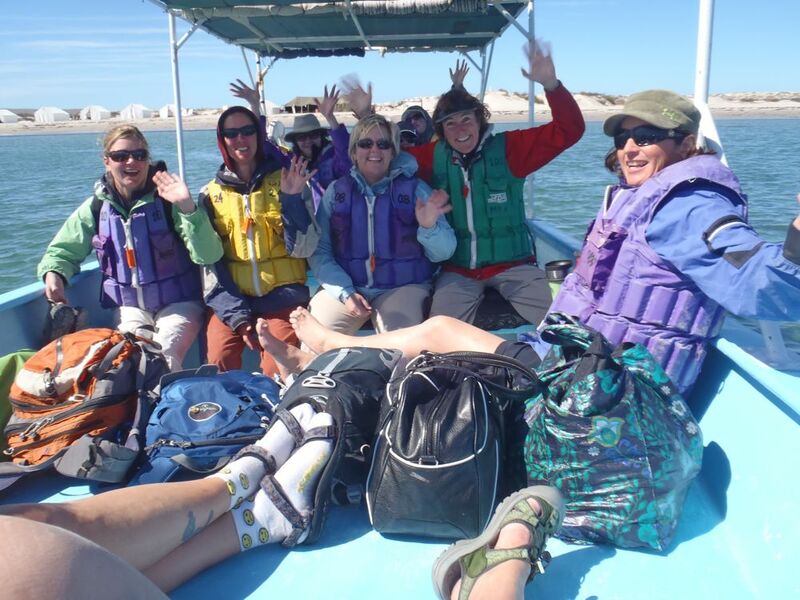 Though thrilled to share the whale experience with my respectful group of women, I was eager to get them safely back to shore and give the whales the space they required to feed. We saw very little spy hopping that day. Humans floating on some form of plastic or fiberglass vessel were no longer a novelty and perhaps more of a nuisance. 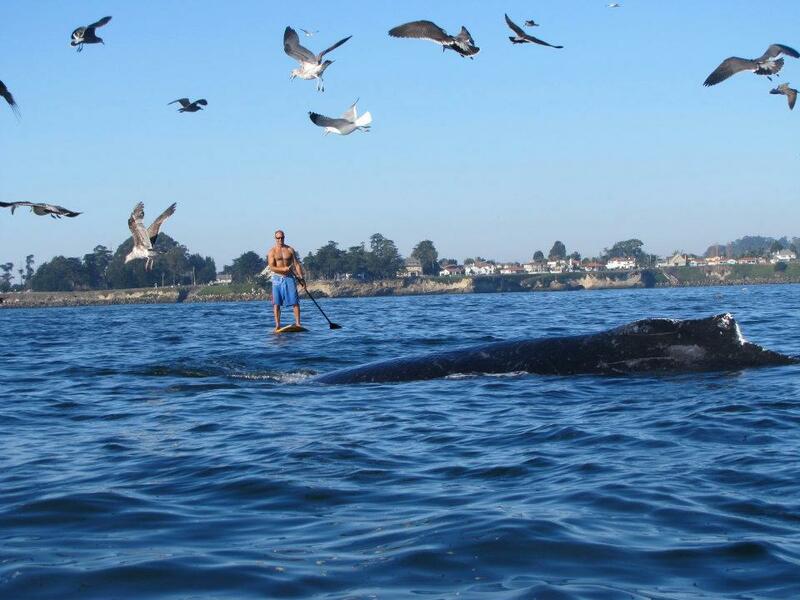 I soon cancelled my upcoming plans to kayak with the whales and turned inquiring customers away. My hope was that the whales were well fed, fat, happy and on their way to tropical seas. Forty eight hours later, the anchovies were gone and so were the whales. Looking for a really unique experience for your students? During our adventurous field trip, we’ll slide off our sit on top kayaks to have an eye level experience with Monterey Bay National Marine Sanctuary! Using goggles or a mask/snorkel, take a look at the kelp forest or choose to remain dry and simply glide over the forest canopy searching for sea otters, harbor seals, sea lions and sea birds. Encompassing 5,322 square miles of ocean, our remarkable sanctuary supports one of the planet’s most biologically diverse marine ecosystems. The use of sit on top kayaks with the option to submerge into the water gives us an entirely different perspective on our ocean world. This is a great fall field trip! In the spring, we’ll launch our closed deck boats searching the water for migrating California Gray Whales with their plump babies in tow. Join Blue Water Ventures every September as we explore the sea caves, rock gardens and rivers of the Mendocino Coast. 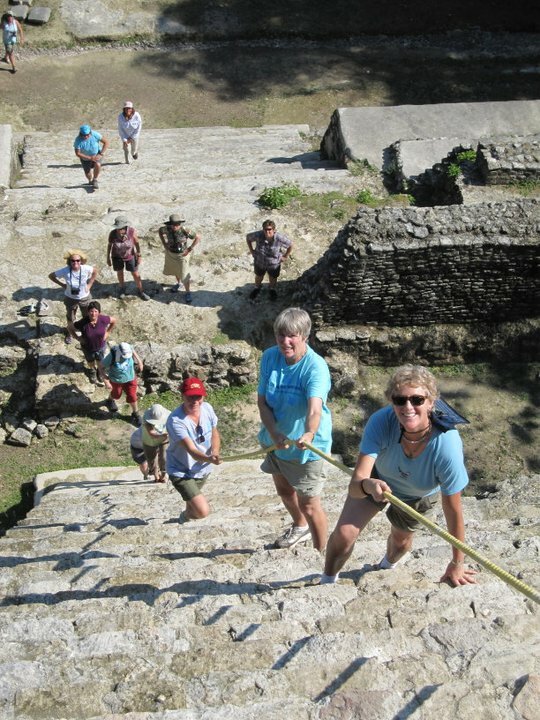 Our next 2011 program is designed especially as a trip for women. Using Sit-On-Top kayaks, we’ll paddle into caves, rock archways and over kelp beds as we look for local residents such as harbor seals and river otters. First time kayakers with a sense of adventure welcomed! Join us! You will not regret it! 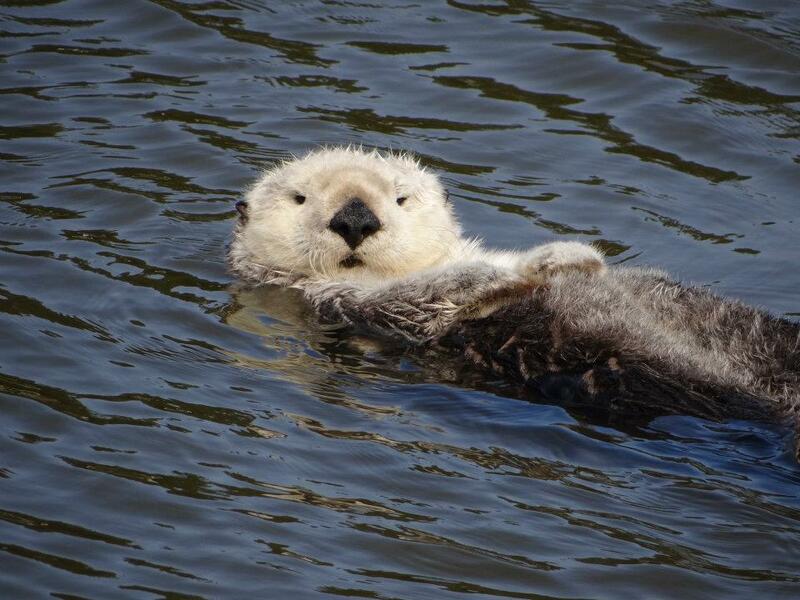 Join the naturalist of Blue Water Ventures as we explore the tidal creeks of Elkhorn Slough. 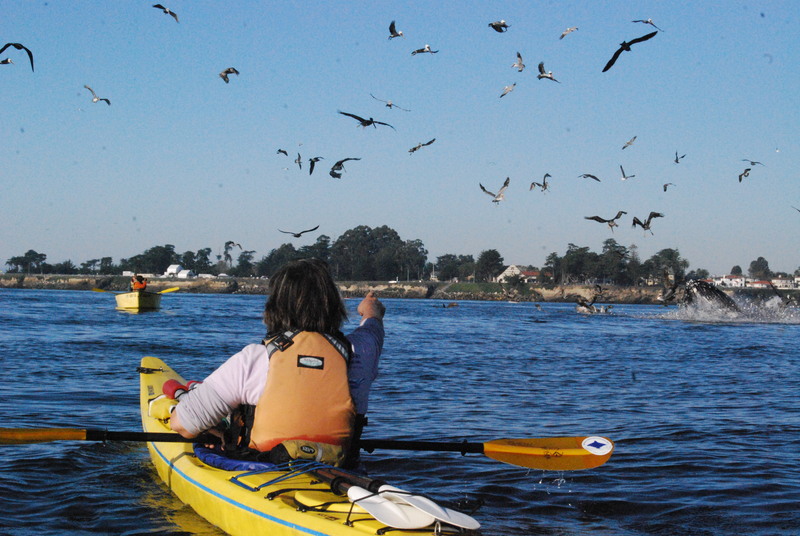 Sea otters, sea lions, harbor seals, sea jellies and an amazing array of migratory birds makes the Slough an incredible area to explore by kayak. Your professionally trained naturalist will explain the intricate details of this amazing marine ecosystem in an informative and entertaining format. Join us for a great day on the water!